Living in Freshwater Everywhere...and Saltwater Somewhere? Bluegills are accustomed to living in a variety of aqua tic habitats. They are native to central and eastern North America. However, stocking programs and other forms of intended and unintended transplants have allowed Lepomis macrochirus to inhabit waters throughout the United States and Mexico. 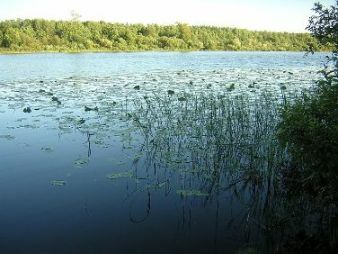 Within this broad range, lakes, streams, rivers, and bays are all suitable habitats. Interestingly enough, bluegills have been found in Chesapeake Bay. This suggests that they can tolerate 18% salinity! (Parr, 2002). Bluegills prefer to live in warm, clear water that is between 60°F-80°F (Rook, 1999). These conditions provide the highest rate of growth and reproductive success. Unfortunately, waters seldom stay within this temperature range. Nevertheless, bluegills can survive in temperatures between 35°F-105°F (Mills, 2004). At the same time, they have a preference to stay near rooted vegetation and silt, sand, or gravel bottoms. In non-reproductive months, bluegills have a home range of about 30 square meters (Parr, 2002). During cooler morning hours, they stay near the water’s surface to stay warm. While they enjoy the heat, this species does not tend to stay in direct sunlight; therefore, it travels to deeper water for most of the daylight hours. For instance, in a small lake, a particular bluegill may stay near shore overnight and travel to deeper parts of the lake after the sun rises. Still, they must fulfill other essential interactions within their niche. Bluegills generally stay in a school of 10-20 fishes (Holtan, 1990). This school may include bluegills and other species. 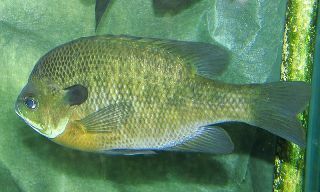 Pumpkinseeds and smallmouth bass have similar habitat requirements; thus, they are often found within the same school as bluegills. Nutritional requirements cause these schools to stay near sources of algae, zooplankton, and aquatic insects. While bluegills consume some species within their niche, they are prey items for larger species. 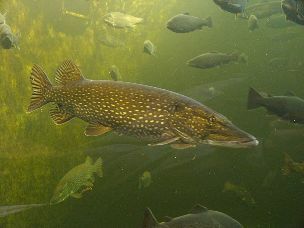 For example, northern pike troll weed beds to search for schools of sunfish species.